Rev. Dr. Juanita Evans Leonard, Ph.D.
Rev. Dr. Juanita Evans Leonard’s professional focus is Spiritual Direction in connection with mental well-being. She brings 50 years experience in counseling, education, and Ministry to CrossRoads. “As a Spiritual Director/Guide, I work one-on-one with clients at all levels towards a Personal Spirituality which you determine is life-giving for you. I apply my listening and assessment skills to help you discover, assess, and apply your own strengths towards your goals for your Spiritual Life. My 50 years of providing leadership and service in the fields of social service, counseling, Graduate Ministerial/Cross-Cultural Education and Pastoral Ministry are foundational to my Spiritual Direction. My skills are supported by: a B.A.in Sociology, Master’s in Social Service, Master’s in Cross-Cultural Studies and a Ph.D. in Cross-Cultural Studies. Over the years, people from multiple denominational affiliations and faith traditions have been part of my ministry. Ordained Minister of the Church Of God, (Anderson, IN). 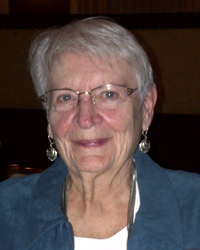 Professor Emerita, Christian Mission Anderson University School of Theology (Anderson, IN). Dr. Leonard also serves/served as a consultant with three Mission organizations. Served in Cross Cultural Mission with the Mennonite Central Committee in Kenya, Africa. Distinguished Service Award from the AAMFT (American Association of Marriage and Family Therapists) of Indiana. Dr. Leonard’s writings have appeared in Vital Christianity, Christian Leadership and other publications of the Church Of God (Anderson, IN. ), as well as Family Life publications of Evangel Publishing Company, Kenya, Africa. A monograph on “Family Life Education” for Mennonite Central Committee was published as part of a series on Development in developing countries. Dr. Leonard edited “Called To Minister Empowered to Serve: Women in Ministry”. This work documents the roles women have taken in the ministry of the Church of God (Anderson, IN). “A Thread of Hope”, Anderson University Press, 2009 recalls the lives of cross-cultural missionary women who served the Church Of God (Anderson, IN).